Is Solar Energy an Option for Your Business? With rising utility prices and a considerable decrease in the cost of buying and installing solar systems, solar power has become a sustainable and cost-effective energy alternative for business owners. Although many small and medium-sized companies are still in the process of understanding how solar energy can make sense for them, more than 100 of the Fortune 500 companies have already received significant results by using solar power. The list includes well-known enterprises such as Walmart, Target, Apple, IKEA and Intel, but many smaller businesses and even non-profits are embracing solar as well. Installing solar power systems might seem like a significant investment initially, but it can provide multiple advantages in the long run. “We talk about sustainability and being able to market yourself as renewable and the importance of that, but the primary driver for most businesses is to reduce their utility bills,” says Garrett Colburn, Director of Marketing Communications and Demand Generation at REC Solar. Backed by Duke Energy, REC Solar is unique among solar providers in that it focuses exclusively on business applications. Energy savings from solar can be substantial. EnergySage market data suggests that the average commercial property owner in the U.S. can reduce overall energy costs by 75 percent by going solar. According to the report, the average commercial property owner paid $1,950 in monthly electric bills before going solar in their operations. They paid just around $500 after installing solar energy systems. Businesses can enjoy the benefits of solar without making an investment through a Power Purchase Agreement (PPA). The solar provider agrees to supply energy to the customer at an agreed upon rate for an extended term, such as 20 years. REC has used the PPA approach to help non-profits such as churches lock in energy savings over the long term. REC and other vendors also offer lease and cash purchase programs. Owners of newly installed solar systems receive a federal tax credit equal to 30 percent of the cost of the solar system as of 2016. Several states also have tax credit incentives. Businesses can deduct 85 percent of their solar investment in the first year as of 2016. As a result, they can significantly offset the upfront cost of a solar system array. By avoiding non-renewable energy sources, companies can create an environmentally responsible image and help support green business aspirations. Solar panel prices have dropped more than 80 percent since 2011. Most small businesses don't have to spend any money upfront because most solar energy system providers offer flexible options like solar loans, solar leases and PPAs. These flexible investment options make it possible for almost anyone to go solar. The costs of solar energy systems for businesses depend on the energy demand of the firm. As a result, the cost can vary significantly from one operation to another. A 30kW solar power system is ideal for most small- to medium-sized businesses. It can cost around $75,000 to buy and install a solar system of that size as of 2016. Many small businesses can go for 10kW solar power system for around $26,000 after deducting the federal solar investment tax credit, the state tax credit and cash rebates. The federal ITC, state tax credits and cash rebates usually reduce the solar system installation cost by about 45 percent. When it comes to output, the cost of per-watt energy with larger solar systems tends to decrease. A variety of factors determines the cost of solar panel installations. The energy requirement of your business is the most important. The cost will also be influenced by the quality and attributes of the system installed. Not all solar panels are created equal. The cost of solar permits and labor are two other factors that determine the ultimate cost of solar installation. Businesses must pay a fee to have the solar energy panels connected to the grid, and installation requires a significant amount of manual labor. The roof on which you want to install solar panels is another factor. It can be very easy and straightforward with some roofs, but a steep roof pitch can make it difficult to install solar panels. Due to a new wave of state and federal policies and positive industry economics, the solar industry is booming. According to reports by the Solar Energy Industries Association, the industry expects to install 14.5 gigawatts of solar power in 2016 compared to just 7.5 gigawatts in 2015. Even with this significant increase, solar energy accounts for less than 1 percent of total electricity production in the U.S., but a recent study conducted by The National Renewable Energy Laboratory reports that almost 40 percent of electricity in the U.S. could eventually come from rooftop solar systems. The growth of the industry is very much reliant on the direction of policymakers. This massive increase in the number of solar panel installation by both residential and commercial sectors is strongly influenced by government incentives. What Parts of the Country Are Best Suited for Solar? REC Head of Project Finance Jon Houghland indicates that geography is important in relationship to solar potential but there are other considerations at play. “The system can kick out savings in Arizona and California,” he says, “but we're also undertaking projects in New York, New Jersey, and Massachusetts. Minnesota has a very large community solar program.” The company also has projects in Oregon and Washington. “It’s not just the weather itself or the number of sunny days. It comes down to utility rates and incentives as well,” Houghland notes. “States such as California and Hawaii offer incentives which make solar very attractive”. The three major array types of solar systems used commercially are roof mount, ground mounts and carports. Over 90 percent of solar installations for businesses are roof-mounted systems because they can usually be scaled most cost-effectively. A limiting factor to solar system size for roof mounted installation can be the available roof space, which can restrict the size of the system. Ground-mounted solar systems are usually larger in size. Companies such as GM, Verizon, L’Oreal and others with very high electricity requirements power their manufacturing facilities and data centers with this kind of solar mount system. But it represents only 4 percent of total commercial installations as of 2016. Companies including Verizon, GM, AT&T, Johnson & Johnson and Intel have installed solar carport systems in their operations. Carport solar systems appear to be growing very rapidly regarding booth average system size and the number of installations. Walmart has completed 12 carport installations in California since 2013. Arizona has installed 10 and another has been installed in New Mexico. 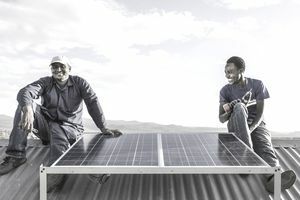 Solar installation is a long-term investment so customers should consider the reputation of their prospective provider. They have the option of going for a new national solar energy company, a local provider or a business with a long resume in the solar installation business. Colburn states that improved storage is the next logical step for solar. Given that energy sources such as solar or wind power can be sporadic, storage can make energy available during periods of low production and help avoid the use of conventional energy to fill the gaps. The competition to provide storage solutions is increasingly intense with competition from Panasonic, Tesla, LG Chem and others. Houghland states that with proper storage, businesses will be able to tap into solar power as needed to avoid peak usage rates for conventional energy and better control their energy expenditure. “It is a really good solution for certain types of businesses with a spiky energy profile." Aside from increased storage, another interesting trend is the curb appeal aspect of solar. While this move is initially targeted at the retail market, it could potentially impact business applications at some point as well. Tesla recently announced that it is launching a range of beautiful roof tile options in conjunction with its Powerwall 2 storage battery. Battery storage is also an important consideration.